One big thing about not eating grains is not having something to smear butter on or eat with coffee the way you can a muffin, english muffin, or other bread product. This can lead to sadness, which can lead to tears. And no one wants to see that. 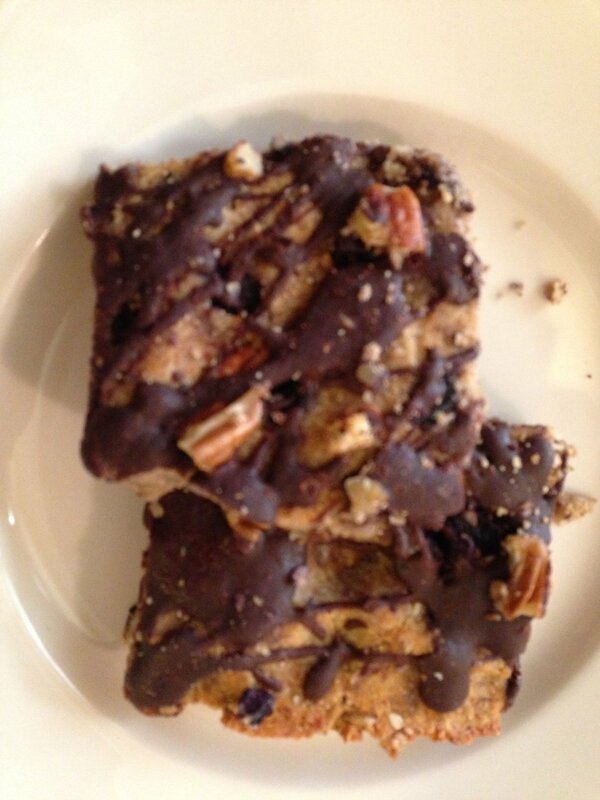 I make these bars now and then when I think I might have a dinner roll breakdown…or sometimes immediately after. Yes, its a recipe born from regret. Enjoy. a little more coconut oil. you’ll see why. Oil a half sheet baking sheet with coconut oil. Preheat oven to 350. 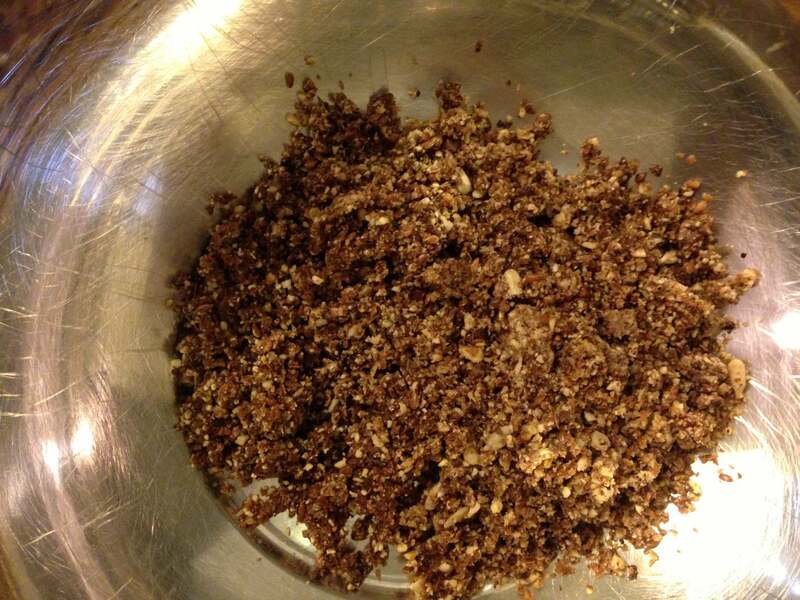 Grind seeds, nuts, raisins, and cacao in blender or processor until marred, but not mealy. You want recognizable chunks. Empty blender contents in a big bowl. Add flours and meal, and stir well. 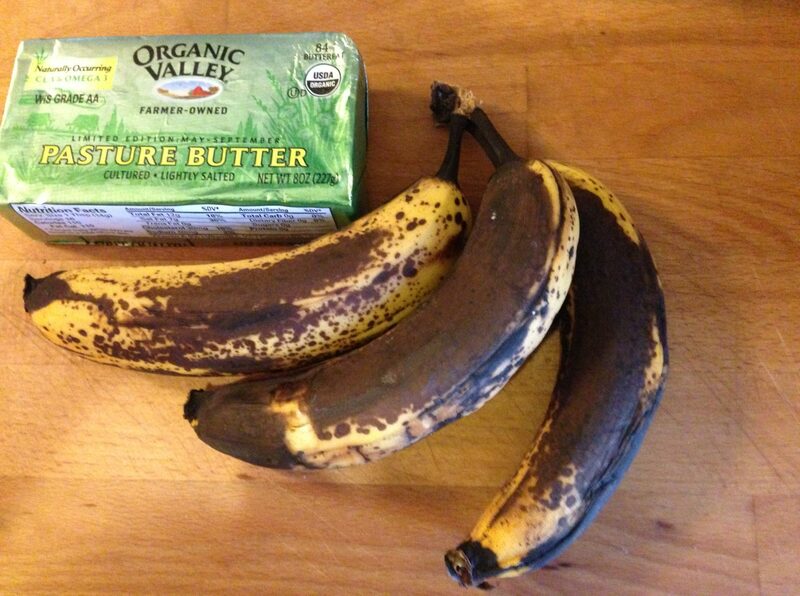 Now combine egg(s), vanilla, and bananas in blender. Once blended add butter/oil mixture. Blend some more. Add wet to dry and stir until it’s a bit of a gooey glob. Press into the baking sheet with your hands and smooth out with a spatula. Bake for ….uh.. 30 min? Sorry, I forgot to keep track. I just check and re-check until it looks dried out and bar-ish. When the house starts smelling like roasted nuts I turn the oven off and let them coast. Let the pan cool all the way. Combine chocolate with a little bit of coconut oil and melt in a pan over boiling water. drizzle melted chocolate in a Pollak-style design all over the bars. Sprinkle with sea salt. Put the whole pan in the fridge for at least an hour before cutting into them. Store in a container in the fridge. Eat for breakfast, snack, dessert, late night munchies… when you’re starving and too lazy to cook…etc. This entry was posted in Uncategorized and tagged breakfast, cacao nibs, flax meal, food, gluten-free, munchies, over-ripe banana, paleo. Bookmark the permalink. Suggestion, if I may…If using honey, make sure it’s Fain’s Honey! These barz are so delicious….